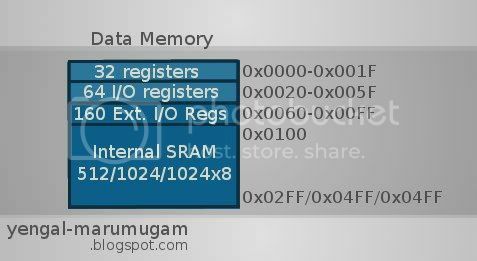 The data memory is divided into 32 locations for register file, next 64 locations for standard I/O memory, 160 locations for extended I/O memory and the next 1024 (* 1K memory for atmega168) locations for internal data SRAM. 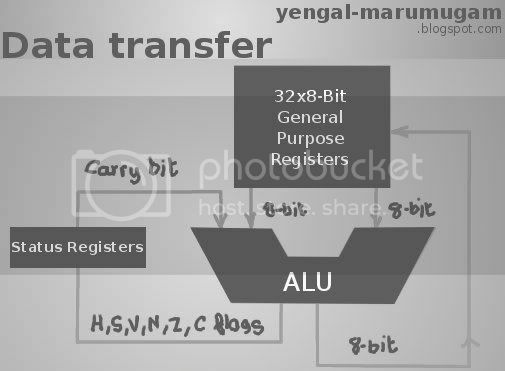 (* Internal data memory varies for atmega48/88/168/328 as 512,1K,1K,2K respectively). The data memory map of AVR is given in the figure. A Register file is an array of registers in a CPU. This serves as the central architectural element of any AVR uC. Each register is implemented by using SRAM (static RAM) with dedicated ports for reading and writing. In AVR, the register file is optimized for enhanced RISC (reduced instruction set computing) architecture with single clock cycle access time, which means 2 operands are accessed from 2 registers, the operated is executed and the result is stored in a register in one clock cycle. I/O Memory: The CPU consists of several peripherals namely interrupt unit, SPI (Serial Peripheral Interface) unit, control register, Watchdog timer, Analog comparator, I/O modules, etc. The I/O memory contains the addresses of the basic CPU peripheral functions and other I/O functions. The function of each I/O memory location is fixed by the designer. It consists of 64 memory locations called as standard I/O memory. Extended I/O Memory: Complex microcontrollers like ATmega48/88/68/328 with more ports and peripheral units cannot be supported within the 64 memory locations. Those extra ports and peripherals are supported by the extended I/O memory which contains 160 memory locations( ATmega48/88/68/328 ). The size of extended I/O memory depends on the micro-controller. Internal SRAM: The Internal SRAM is the general purpose RAM used by the programmer for storing the intermediate values and results. Hence, it is also known as Scratch-pad. They can be accessed directly by using their address and indirectly by pointers (storing their address in register pairs). The memory locations can be accessed sequentially by use of X,Y,Z pointers (which support auto-increment,-decrement). The size of internal SRAM depends on the micro-controller ( discussed in data memory ). Stack Pointer : The Stack is used for storing temporary data, local variables and return addresses after subroutine calls. The stack pointer points to top most memory location of the stack. The stack advances from higher memory location to lower memory location. It is implemented using 2 8-bit registers in I/O space.